Casa de Grethel, is a beautiful house in the peninsula of San Miguel (Tayazal). 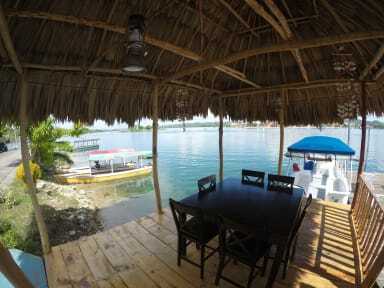 The hostel has all that you need for enjoy your days in Flores, Petén. If you like to walk you can do it around of Tayazal and visit a small ruin, public beach and have a complete view of Flores, San Andre and San Jose. The property offers you a complete kitchen, dining outdoors, exercise machines, Wi-Fi access and Netflix. Breakfast can be served daily upon request. The property is located in the peninsula of San Miguel, near the beach (Lake Beach), 2 museums, the city of Flores and a one hour from the Ruins of Tikal. Flores is very well-known as a gateway to nearby Mayan ruins. 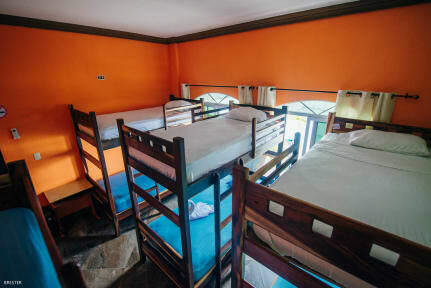 Hostal Casa de Grethel offers a wide range of accommodation private and shared rooms. All rooms have A/C, private bathroom and cable TV. Some with views over the lake.